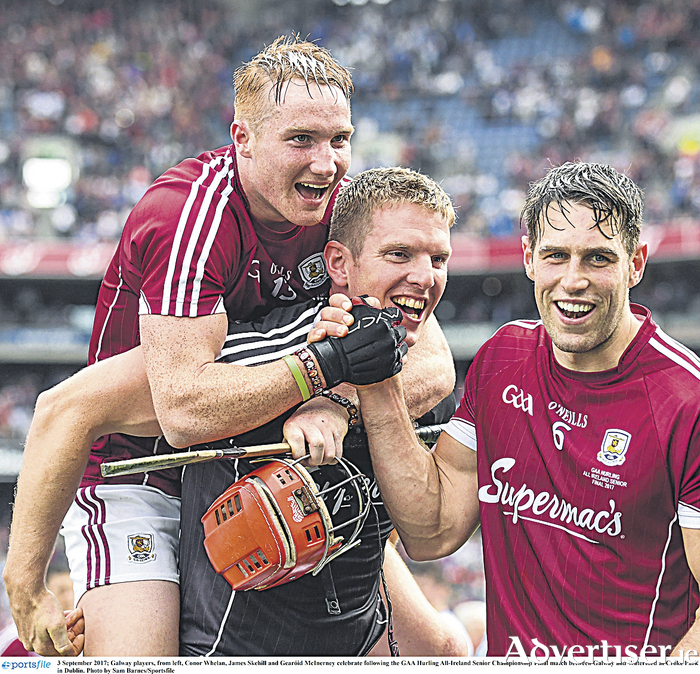 Galway players, Conor Whelan, James Skehill and Gearóid McInerney. Taking slugs from a water bottle, still dripping in sweat from the effort of battle a short time earlier, Joseph Cooney sat patiently alongside manager Mícheál Donoghue under the Hogan Stand on Sunday evening. The Sarsfields man had just emulated his father Joe in winning an All Ireland senior medal after a tenacious and hard-fought battle against Waterford. While he lived out his childhood dream on the field last Sunday, his praise was directed towards the eight panel members who knew that they were not going to be able to influence things on the field last Sunday. “I believe numbers 27 to 34 won this All Ireland for us,” said Cooney. “I’d give huge credit to Micheal and the lads. I was delighted before the match started to see all of those lads in the team photo with jerseys on fully togged, that’s a huge mantra for me. I have never experienced that before with previous management teams and that’s what we brought. So how does it feel to have won a Celtic Cross in the biggest hurling show of the year? That unity of belief in the entire panel got Galway over the line on Sunday, with subs Niall Burke and Jason Flynn making massive impacts as the game entered the championship minutes in the second half.